This case was presented in a conference I attended. I had never heard of the case before but made the observations that I give here during the conference, in real time, without any knowledge of the case. The reason I state this is that I want it to be clear that these observations can be made prospectively and were not enhanced by any retrospectoscope. A middle-aged woman with a PMHx of HTN and smoking arrived with chief complaint of substernal crushing chest pain for 8 hours, getting worse. The QTc is 427 ms. There are nonspecific T-wave inversion in V4-V6 which the clinicians were worried was due to ACS. Because of the new T-wave abnormalities, the patient was brought to the critical care area for suspicion of ongoing ACS. She describes pain which woke her up from sleep as a constant, crushing pressure in the mid chest, and is very positional, much worse with laying flat. She has never felt this before. There was SOB, but no nausea, vomiting, diaphoresis, or radiation to arms, back or neck. This patient could not comfortably lie flat on her back. 1. T-wave inversion is very nonspecific. When due to ACS, T-wave inversion is usually due to reperfusion, not due to persistent occlusion, and in ACS the patient should not be symptomatic at the time of the T-wave inversion. Especially if you are worried about acute coronary occlusion, the T-wave inversion represents a state when the artery has re-opened and usually the patient is relatively pain free. When I saw this, I said (paraphrase): "This ECG is very nonspecific and does not convince me of ACS." 2. Even more important, ACS pain is not positional. Inability to lie on her back is highly suggestive of some other pathology. There was some possible improvement with nitroglycerine. The Cr returned at 2.6 mg/dL. The first troponin I (contemporary 4th generation, sensitive, but not high sensitivity) returned below the level of detection. Comment: Someone with crushing chest pain for 8 hours due to acute MI will almost always have a detectable contemporary troponin. This is strong evidence against ACS as the etiology. Physical exam was unremarkable, with equal BPs and pulses in both arms. A bedside cardiac echo was done and was normal. There was no dilated aortic root. Comment: absence of evidence of acute aortic dissection on ED bedside echo is not good evidence of absence. Examination of the aortic root has inadequate sensitivity. Accuracy of the exam improves if one also does a suprasternal view of the aortic arch, and even better if one adds a view of the abdominal aorta, as dissection frequently descends to this level. 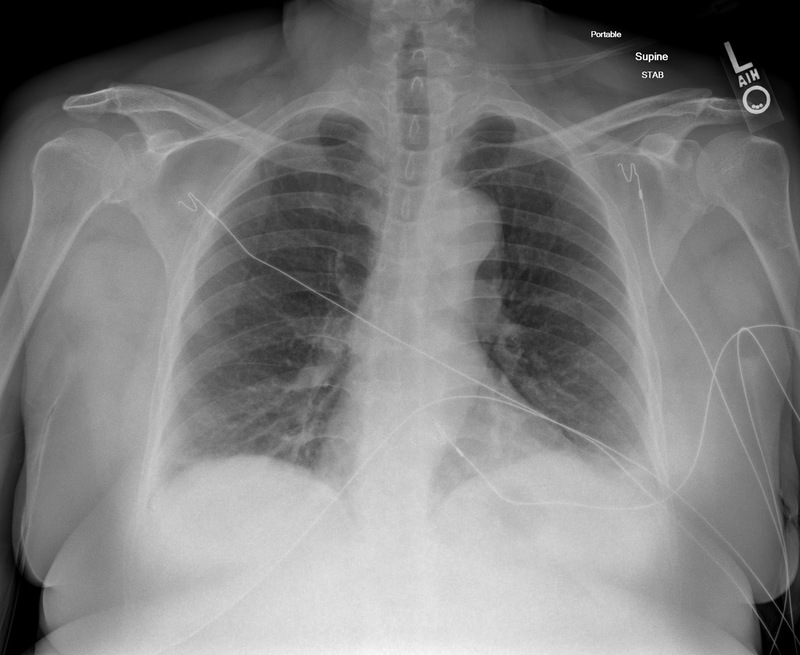 Cardiology was consulted and they were worried about ACS, but did not think the patient needed cath lab activation. They recommended ticagrelor and heparin. Comment: When I heard this, I was very concerned as aortic dissection was still high on the differential. ACS did not fit the data. I was worried about anticoagulation. Comment: When I saw this in the conference, I saw a large aortic knob and was very worried about aortic dissection. The clinicians did not see this at the time. A D dimer returned at 3300 (greater than 10x ULN of 229 for this turbidimetric assay). Comment: At the cutoff, D Dimer is a very sensitive test for dissection/pulmonary_embolism, but does not differentiate between the two. When it is this high, it has a good positive predictive value for thrombosis. The clinical presentation was very atypical for PE, so this is also very concerning for aortic dissection. The clinicians then were then worried about pulmonary embolism, but did not want to do a CT pulmonary angiogram because of the high Cr. So they did a VQ scan, which was normal. The patient was taken to the ICU. Serial troponins were negative overnight. The patient had no complications of the anticoagulation. She underwent successful surgery and did well. 1. Chest pain characteristics matter. In a patient with severe chest pain that has you very worried, positional pain should make you question the diagnosis of ACS and look for other serious pathology. 2. In coronary occlusion with persistent pain, the T-wave is usually upright, not inverted. 3. With prolonged chest pain in ACS, the troponin is rarely below the level of detection. 4. 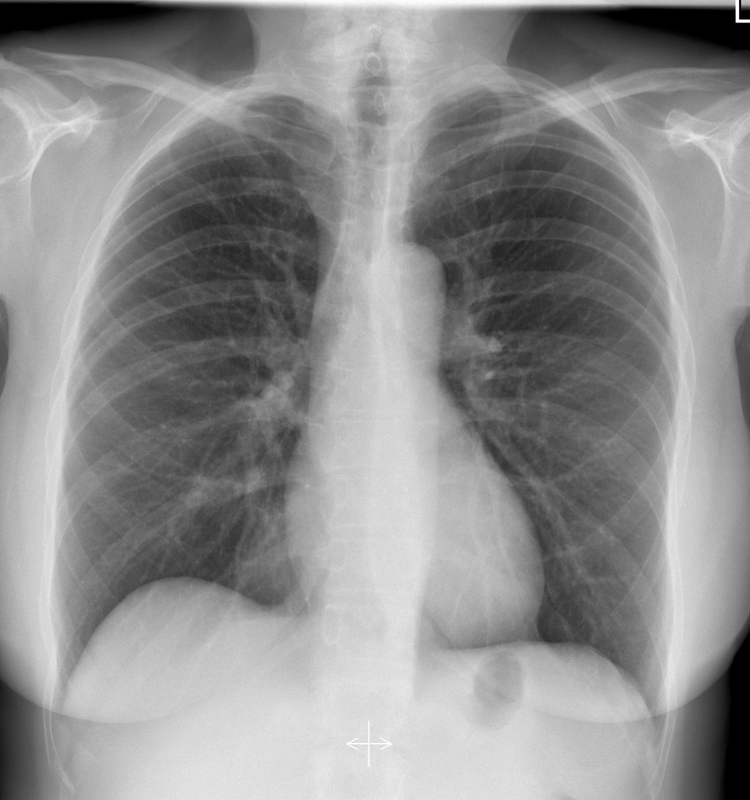 Chest X-ray is useful in aortic dissection. In the International Registry of Acute Aortic Dissection, 79% had an abnormal aortic knob or widened medistinum. Only 12% had no abnormalities. A large aortic knob is very worrisome. 5. Bedside Echo of the aortic root may be very useful to rule in aortic dissection (good PPV) but does not have adequate sensitivity to rule out dissection in a high risk patient, especially if there is no suprasternal view. 6. ACS does not result in a very high D Dimer. They are rarely more than twice the ULN. 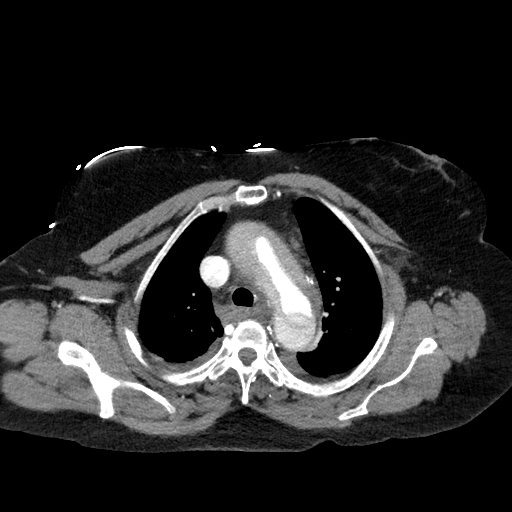 Aortic dissection does result in a high D Dimer. 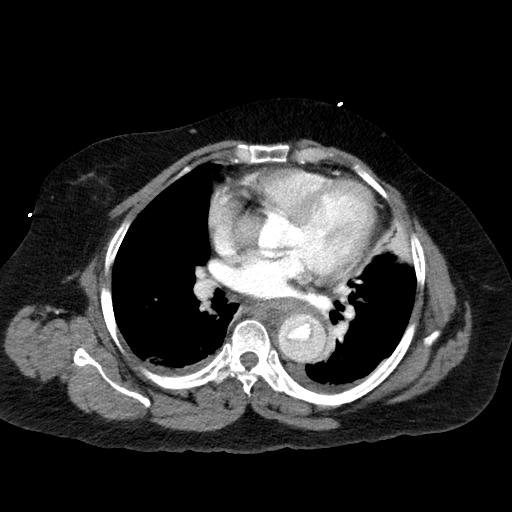 If D Dimer is very high, and pulmonary embolism is ruled out, then one must fear aortic dissection and look for it immediately. 7. A Cr of 2.6 mg/dL is only a very minor relative contraindication to contrast CT scan. When there is a potential life threatening diagnosis, do not avoid it. ....very interesting care report. Thanks for the details which describe the case. Great case with some great teaching points! Do you have any speculation on a possible etiology of the T-wave inversions? T-wave inversion like that is a very nonspecific finding due to any number of benign conditions. Even hyperventilation or post prandial. Not necessarily ischemic. Very nice case. I was also wondering about those changing T waves. Don't you thing it could be from LVH (let say... from HBP as an aortic dissection risk factor)? She have a + Cornell LVH sign (S in V3+R in AVL > 20 mm), which is I think very specific for LVH. T wave change can be variable in LVH. Just wondering. They do not look to me like typical LVH, though of course they could be. They look like very nonspecific T-wave inversions. D'ou est-ce que vous venez? Montreal. I'm the chief of Emergency Medicine at Montreal Heart institute. Fascinating blog, I could say. Cheers. Thanks, Alain. sorry for delay in moderating your comment! Nice case. However, why were T waves inverted in Lead V4-6 if coronary arteries were not involved? Thanks. Excellent case. A very important point you have made. An elevated creatinine is a relative, not absolute, contraindication to dye exposure. Few will develop permanent renal failure from 100 cc of contrast. When I looked at the first ecg I thought of a case where v5 and v6 where reciprocal to ischemia in the septal leads. In the first ecg there is a t wave that towers over the r wave in v1 and v2. Obviously this ended up not being acs, but is it appropriate thinking to consider acs based on those findings? It is appropriate to consider ST depression in V5 and V6 as reciprocal to ischemia (ST elevation) in septal leads, but not T-wave inversion. Thanks for years of great ECG education. Here, you state that T wave inversion is non-specific yet in other cases you mention T wave inversion being a marker of reperfusion. How do you tell which is which? A lot has to do with morphology, which is hard to explain, but, more importantly is the whole syndrome: If T-wave inversion is due to reperfusion, the patient should be pain free, or nearly so. This patient continued to have very concerning crushing chest pain. That does not fit with T-wave inversion. Then add up all the other data: negative trop after 8 hours, positional pain, high d dimer, large aortic knob. Then you can see that this T-wave inversion does not fit an ACS etiology. Right? Good question and I'm glad the blog has been good for your education!